Anyway, as it happens this was the first time I had ever given a paper in Cambridge. If anyone had been waiting for the last (almost) 25 years (since I started my post-graduate research) for me to register on this index of academic acceptability, I can't help feeling that they'd have been more than a little let down, for reasons that will become apparent. The paper was in many respects a re-run of the hastily assembled piece I presented in Edinburgh last May but I had decided to make it a case study of Gaul. This meant editing out the comparative thoughts on Spain, England and Italy, which in turn gave me room for an expanded section on defining the state and for some more detail on the Gallic situation. Here I will just give the 'new bits' (although some is lifted from a paper I gave in Manchester, years ago, on 'state, violence and state violence') and then move on to the important bit, which is the response from the audience. "There are two ways of reading my title. From its current phrasing, you might probably see at as discussing the demise simply of a particular ideal sub-type: the end of the ‘late antique state’. Let’s call that the ‘weak thesis’. Alternatively, it might be seen as meaning the end of anything that can reasonably be called a state with any analytical precision, in the late antique west. The latter, ‘the strong thesis’, is actually the way that I mean it and so I should probably have entitled the paper ‘the end of the state in the late antique west’, although I feared that that might imply that that was where the state ended; that the state didn’t continue in other areas. The ‘strong thesis’ is what I want to try and convince you of, but if not then I hope acceptance of the weak thesis will suffice and that you might pick up on other issues of interest, although, truth to tell, the weak thesis is a bit banal. The idea that anything that could helpfully be called a state ended in around 600 in western Europe is a historiographically unfashionable view. It has become normal for people to talk about ‘the state’ in early medieval Europe. There are different ways of looking at the genealogy of this topic. In some ways the idea of the early medieval state has quite deep roots, since some of the 19th-century Germanist historians did not seem to have much of a problem in thinking about the ‘Staat’ in this period. On the other hand, the idea of the break-down of the state is also pretty old. In days of yore the post-imperial world was seen as experiencing a collapse into anarchy. In that context people discussed things like ‘blood-feud’ which were supposed to have existed as ‘self-help mechanisms’ in a stateless world – supposed to have existed at all, some would say – the rise of ‘feudalism’ was seen as a response to untrammelled violence and disorder. The move away from these historical myths has entailed the rise or more properly the rebirth of what I at least consider to be another; that of the early medieval state. It is quite likely, I imagine, that the scepticism about early medieval statehood arises from the influence of thinkers like Weber, whose definition of a state does not really fit early medieval examples. Subsequent theorists have tended to go down similar routes. But in early medieval history, there has been a counter-move, towards rehabilitating the notion of an early medieval state. This is, to no small degree, linked to the rise of what is called the ‘consensus model’ of early medieval politics, which argues that political negotiation and the use of royal ritual created the consensus necessary to keep aristocrats in league with the kings and indeed get anything done. This is a move linked most obviously to the writings of Professor Dame Janet L. Nelson. The idea of a zero-sum model of politics, wherein a growth in aristocratic power equals a commensurate reduction of royal power (or vice versa), was seriously questioned by, for example, the ‘Bucknell Group’. More fashionable now is the idea that kings and aristocrats worked together in mutually beneficial fashion, in which a growth of the power of one can lead to a growth in the power of the other too: a constantly increasing total amount of power, if you like. Many good historians have shown pretty convincingly that early medieval people had an idea of a political community that existed outside the persons who happened to rule in particular ways at particular times and places. Whether or not – like me – you don’t think that a Personnenverbandstaat is much of a Staat at all, even the most un-state-like of early medieval realms existed on the basis of more than mere personal links, though I suppose there could have been short-lived exceptions or temporary blips. All this, for sure, has shown us that cohesive kingdoms existed in the early Middle Ages and this has been elided into the idea that therefore such polities were states. Indeed in 2003 someone called Halsall published a book about Warfare and Society in the Barbarian West, which talked willy-nilly about coherent kingdoms as ‘states’. But cohesion, to me, does not equate with statehood. None of the more recent ‘statist’ historiography, which is usually (though not always) impressive in qualitative as well as quantitative terms, seems to me really to have made the case for thinking of the early medieval realm as a state, in an analytically useful fashion. No one has managed to explain the demise of the late Roman bureaucratic state in the west – for I think that unless you are Bernard Bachrach, Jean Durliat or Walter Goffart, you do have to accept that the Roman state did end. No one has managed to produce a reliable and/or theoretically coherent ‘worked example’ which shows exactly how aristocrats and kings worked together to maximise the power and authority available to each. Although the zero-sum model may not have existed as such, in its crude form, I do think that something very like it did exist: in other words that the acquisition of certain types of local power by local or regional aristocracies did mean a relative diminution of the effectiveness of central government. When all power, ultimately, comes from the land, there is really no way of avoiding this point, as I shall return to discuss in a minute. Similarly, the flaws of the approach are pointed up if you look at ‘horizontal’ as well as ‘vertical’ competition, that is to say competition within the strata of the élite classes as well as between them. No one, to my mind, has explained, why, if, in the words of one fairly recent (if unreliable) writer on the topic bluntly says, ‘the struggle for political power was not a zero sum game’, was there a struggle at all? And indeed the consensus, statist model of the early medieval state does usually appear to be pretty struggle-free. Almost every paper on the topic piously says at some point that ‘we should not assume that this was a cosy state of affairs’ although, if one continues to read, one rarely gets the impression that it was anything but a cosy state of affairs. And yet these were polities where kings blinded their own sons, where civil wars broke out that occasionally at least resulted in fairly bloody battles, one of which produced the death of one of the authors much studied by those holding to the consensus view. As I wrote in 2003, ‘there is precious little heroic in death brutally administered by spear, axe and sword’. So what on earth, if everyone gained, were they fighting, killing and dying over? There are perhaps three main problems with the current historical trend in favour of the early medieval state. First, all the work upon ‘buying in’, upon consensus, has moved us too far away from coercion, from the radiating out. For a state to exist meaningfully both have to be present. A state must be able actively to penetrate local and regional society from above as well as to persuade local and regional élites to invest in it from below. To take an example, local aristocrats and others might have used the legitimacy of power provided by involvement in the structures of Charlemagne’s realm to further their own ends. This helped the coherence of that realm as a political entity. But what if any chance did Charlemagne have of enforcing compliance with his wishes in the localities? The former state of affairs suggests a coherent kingdom but only if we can answer the latter question with evidence of at least relatively effective instances of coercion are we in the presence of a state. The second problem, closely related to the first, is that historians of all perspectives, Marxist or otherwise, have assumed an alliance between local élites, or aristocracies, and central government, kings, emperors or whatever. Yet this alliance has never been shown to be necessary. Indeed I think it is a fundamentally mistaken assumption. This will underlie much of what I am going to talk about. The third problem is that the appreciation of collective power has come at the expense of a neglect of what Mann called distributive power: power which, if more is accumulated in the hands of one person or group, does involve a decrease in the power of another. We must appreciate, as Mann argues, that both types of power exist simultaneously, and so that we are not talking about a crude zero sum game. In an early medieval context, there is an important materialist challenge to the concentration upon ideology and collective power. The period that concerns me (and indeed most of the early medieval period in the West) was one where power ultimately resided in the control of land and its surplus. Most of it was non-monetary and, on either side of the 600 watershed, there were few truly urban centres. Trade and commerce were in any comparative sense, rudimentary, in spite of the wealth of very good work done in recent decades on unravelling such exchange systems and networks. Certain types of power might have been collective and potentially infinite, but the material basis of power was finite. Especially in a period with low seed-yield ratios, there was a very clear limit on the surplus to be drawn from land; technology limited surplus extraction to muscle power, human and animal – again finite. And the amount of land available was – also – finite. Thus whatever the ideological and other investments in effective power, when you come down to the basics, the resources of power were limited. There is a very basic – indeed a brutal – implication of all this. In a socio-economic situation such as existed in western Europe after the break-up of the Roman Empire, armed forces could only be maintained by and rewarded with land and/or (as just noted) comparatively limited surpluses from land. Thus armed force, and armed force like agricultural techniques in this period, was a simple question of human and animal muscle, was a fixed resource. Control over armed force, over the military source of power, was, ultimately, therefore distributive. By way of a hypothetical illustration let us suppose that territory X, a component of Kingdom A, can support 200 warriors from the surplus generated by its land. If access to Territory X is lost by the King of A, either through conquest by Kingdom B or the secession of the local Governor of X, then the King of A loses 200 warriors, whose control is gained either by the King of B or the Governor of X. He cannot simply raise another 200 men to replace them. He cannot increase the surplus commensurately from the rest of his lands to support the extra men – either technologically by increasing yield, because the means don’t exist, or through increasing the rent or tax because that might reduce to starvation the workers of land, who, remember live on a low, indeed knife-edge seed:yield ratio. Nor can he feed 200 more men through state credit or loans, or control markets and so on to pay 200 men in cash. In the post-imperial situation it is difficult even to raise 200 more men: no large urban or rural excess poor populations, the fertile recruiting grounds of later eras. In the military technology of the times, and the time taken to train a warrior, even producing 200 men as tactically effective as the 200 lost from X is going to be difficult. A polity whose rulers do not tax and thus have no income derived other than from their position as simply one élite landholder among many, and who have no effective independent coercive force, cannot, in my vaguely Weberian view, be called a state. I hope to demonstrate and possibly even explain that proper states came to an end in the West (however temporarily) around 600. The state is a differentiated set of institutions and personnel embodying centrality, in the sense that political relations radiate outwards to cover a territorially demarcated area, over which it claims a monopoly of binding and permanent rule-making, backed up by physical violence. Mann, of course, also argued that a state had to control all four of his sources of social power: ideological, economic, military and political. He also, interestingly, completely skipped over the period that concerns me today. Indeed, as far as I can see the whole 5-600 years of the early middle ages constitute the only era of recorded human political history in Europe that he did skip. Nevertheless, on p.390 of The Sources of Social Power he does say that some post-imperial states existed but that they were small and short-lived. I can say fairly confidently that he is wrong on both of these counts, for the period before 600, but not after. This might broadly be acceptable as a definition, although I might quibble about point 5, or at least require a fuller definition of what was meant, and I would certainly place heavier emphasis on point 1, stressing the crucial importance of independent coercive force, possibly even above the idea of a monopoly. Such a definition tallies reasonably well with those of other thinkers, including those who work on the middle ages, such as Susan Reynolds. It is broad enough to encompass a range of state forms, as perhaps we shall see, but it is also strict enough to rule out other forms of complex political organisation. The risk run by the current consensus view is that it becomes difficult to see any sort of extensive, coherent polity that might not be called a state. A recent review of an edited volume on the early medieval state concluded by saying that although students of later periods might find it odd to see early medievalists talking about states in their period, this volume made it clear that specialists on that era saw no problems in using the word and that ought to suffice. I don’t think it does suffice. To return to Wickham’s definition, and to cut to my general thesis, I think that the polities of western Europe before a period of change that I refer to, as a shorthand as ‘around 600’ would generally fit that definition, with a few minor modifications, but that those after that period would not. To demonstrate this, I will, as stated, focus upon Merovingian Gaul." This conclusion forms the basis of other arguments about the extent of economic decline in the north and, as mentioned, therefore of the weakness or poverty of the local élite, which could sponsor such craft specialisation and an exchange system over a wide area. But we can examine these statements on the basis of Didier Bayard’s study of this form of ceramics and if we do a rather different picture emerges. We find that in his early fifth-century Phase 2, almost all Argonne ware is actually found within a 300km-radius of the kilns (6 sites yielding such pottery beyond that radius compared with 66 within it) and within in a box 500km east-west by 300km north-south. That’s an impressive area of 150,000 km2, but still rather less than the 500,000+ km2 implied by Wickham’s statement. 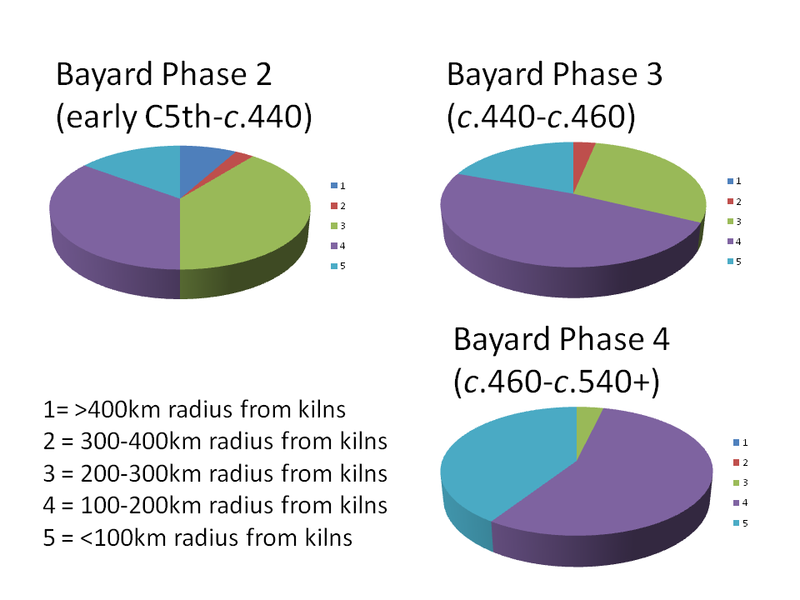 More to the point, by the time of Bayard’s Phase 3 (roughly the 440s to 460s) this had contracted so that all was within a 300km radius, 67-79% of it within 200km. Most lies in a box covering 120,000 km2 which is about the same as the area you could calculate on the basis of the radius of distribution. Thus, this contraction, which Wickham implies was something that had happened only by the later sixth century, actually happens by the middle of the fifth century and the abandonment of the Rhine forts. 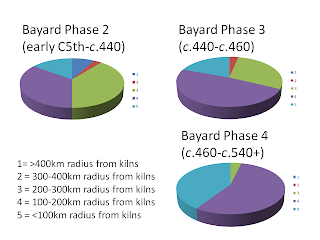 In fact, even by the time of the political end of the western Empire, Bayard’s Phase 4, the distribution of Argonne ware had already contracted so that 98% of it was found within a 200km radius – in fact within a 200kmx200km box (a considerably smaller area) – though fairly evenly distributed within that area. Argonne ware does indeed continue into the late sixth century but it is worth clarifying that the last decorated phase dies out around 540 and thereafter only standard undecorated forms are produced. In terms of sites producing this pottery, for Phase 2, N=74, for Phase 3, N= 62, and for Phase 4, N = 27. This would seem to show a big decline from the last quarter of the fifth century. Bayard says that output for Phase 4 is about the same as for Phase 3, which, if so, would seem to show that there are fewer sites using this pottery rather than there being less pottery produced. Now this, I think we can agree, is not quite the picture that Wickham paints. Overall, the collapse of the Argonne fineware production was rather earlier and rather more serious than is admitted. Instead I would argue that this picture tallies rather well with my own reconstruction of the northern Gallic élite, never wealthy to start with, being critically badly hit by the end of the western state around 400 and, by the second quarter of the sixth century, having gradually been reduced to the status of a service aristocracy by the canny policies of Clovis and his sons." I've never been good in the question sessions after papers. In fact I'm useless. It's a big hole in my game. Some might call it the academic equivalent of a glass jaw in boxing, although Audley Harrison* doesn't have the option of pondering it all, publishing a thoughtful theoretical justification of why it was actually better for him not to duck that haymaker, and getting a retrospective win on points or at least a draw. I've never been good at thinking on my feet; better at mulling things over and at reflecting on them in depth. Not having attended the Academies of Slick Bullshitting I've never mastered the techniques of the Airy Dismissal, the Dazzling-But-Glib Analogy, or expressing yourself in language so carelessly leaden and obscure that everyone thinks you're brilliant because they haven't got a clue what the hell you're on about. My own approach tends to focus on waffling, going off the point, speaking for too long and generally bumbling, compounded by the fact that I'm no good at all at wrapping my answers (such as they are) in the usual good manners - 'thank you for your question', 'that is an excellent point', that sort of thing - which makes me seem blunt as well as waffly: quite an achievement. Nonetheless, it was a virtuoso shambles in Cambridge on Tuesday; if there was a Eurovision Waffling-and-Floundering Contest, this would have cemented my status as the Johnny Logan** of the event. That being said, it should not detract from the fact that the questions and issues raised afterwards were uniformly very good, important and helpful. Catherine Hills pointed out that it would be useful for me to up-date the distribution maps that I still use from my early work on Metz, in the light of the masses of new data that has come out since then. Indeed I ought to do that, not least because the maps are purely based on cemeteries, whereas we now have significant quantities of settlement evidence. Nevertheless, my sense is that that work doesn't actually affect the overall patterns and conclusions that I drew then. One of the more infuriating things about the fact that my work never gets cited in France is that much of the new work in fact generally confirms the model I proposed in 1995. Charles West asked whether there were indeed no means of increasing yield in the early middle ages (with reference to my point about the finite and therefore distributive nature of power). I dare say I need to do more reading on this, for nuance at the very least, but my understanding is that, clearing new lands and bringing them under the plough aside, the really significant increases in the ability to raise the productive level of land, through better seed-to-yield ratios, didn't come about until rather later in the middle ages and after. Talking to Rosamond McKitterick afterwards made me think that using Charlemagne as an example in my discussion of the state was probably not a good idea. Charlemagne - at least early on in his reign - does seem to have been able to employ coercive and punitive force against his aristocrats. But then I do think that the reign of Charlemagne (or at least its first 2/3) was something of an unusual phase in post-seventh-century Frankish rule. More significant was Charles' point about the Church, which - as (depressingly) usual - I am guilty of neglecting, in favour of a concentration of lay power, lay office and so on. If I did mention the foundation of churches and monasteries in town and country it was in the context of lay aristocratic consolidation of landholdings, and in discussion of a shift towards more biblical ideologies of power - points that in many ways render my ecclesiastical blind-spot more culpable still. In conversation, Charles elaborated on this by talking of where the really dense 'nodes' of social relationships were in the early middle ages. This seems to me to be an excellent issue to ponder, and I think there would be two principal axes to the analysis. One (perhaps the more direct, but no less important) would be the way in which central government controlled the localities by using the institutions of the church, perhaps counteracting local aristocratic powers (much good work on this for the Carolingians and Ottonians); the other, more subtle, would be to move through the idea, related to the last point, that perhaps church offices and thus personnel in fact came to be - de facto - the 'state personnel' or the 'state class', replacing earlier secular offices and office-holders, to the idea the ideology of the church and its involvement with kingship played a crucial part in 'gluing' the localities together into a polity. This latter is the focus of a great deal of excellent analysis by Carolingian historians (Professor Dame Janet L.Nelson, Rosamond McKitterick, Mayke de Jong, etc. etc.). The first line of attack might not affect my overall thesis too badly, either because the control of churches and monasteries in late seventh- and eighth-century politics seems to have operated pretty clearly on a zero-sum principle, or because this sort of role was less in the sixth century and royal control, proportionately greater. It is the second line of attack that concerns me more, and keys in with other questions about early medieval analogies to 'civic duty' and similar components of the state. This makes me wonder whether I have been too keen to play up the necessity of the possibility of autonomous action (which is a better formulation than coercive force) and play down the ideas of consensus (though I remain convinced that they do need a bit of a critical re-think: if people radically interrogated the insidious work that the term 'consensus' does in political discourse they might find a way out of the bind of talking about consensus and then having to make statements - which rarely carry much conviction - that this didn't mean things were cosy). This was then compounded by a question from an anthropologist (whose name alas I didn't get - if you're reading this, get in touch!) to the effect that polities where the use of coercive force is necessary and frequent, regardless of the ability to use it, are regarded as failed or failing states. I'd probably need to mull this over more but on the whole I thought that this really was an excellent point that I hadn't considered before. At all. The Importance of Being Erroneous (once in a while at least) - and acknowledging it! So. A lot to think seriously about and I consider that that is an excellent seminar outcome for a speaker. The best outcome (possibly) is for everyone to love what you've said and think it really important, but next best is to get useful feedback, even if it means you have to abandon some ideas and theories. The feedback I received, I should say, was presented much more on the lines of an active engagement with the ideas presented than simply from a confrontational desire to stick to an alternative or opposing line, even if people didn't agree. That is so much better as an outcome than the bland 'yeah, fine, whatever' that one can encounter all too often. Much to ponder. As it is I might be able to reconfigure my thesis in a sounder and more sophisticated form, or it might be that I am - basically - wrong about all this and that what we have is indeed something akin to my 'weak thesis', that what happened 'around 600' was more a shift in the nature of the state (or the type of the state), rather than the state's actual demise as a useful category. That could, on the basis of the points raised, be more interesting a proposition to explore than I thought. Quite a big thing to be wrong about, given that I was toying with The End of the Late Antique State as the title for the (or a) book of the project, but if that's the way it is, that's the way it is. One of the many things that I try (and seemingly increasingly fail) to instil in my students is the idea that education is a journey and that dwelling on the qualification alone - the destination - is the equivalent of the budget airline option. You could say something similar about 'being right' in history. It's not a destination - there are no right answers, as we all (well, most of us) know, but some are less wrong than others - but a journey. We should enjoy that journey. We should value the detours and having the confidence to accede to the request to 'turn around when possible' because they all help us to get to know the historical landscape and the things that matter in exploring it. So - to conclude - to all of you who came on Tuesday: thanks very much and sorry about the waffling! * A British pugilist renowned principally for falling over quite early on in his fights. ** Australian-born Irish warbler, famed for the unequalled feat of winning the Eurovision Song Contest twice as performer and twice as song-writer (three wins overall).